You are invited! 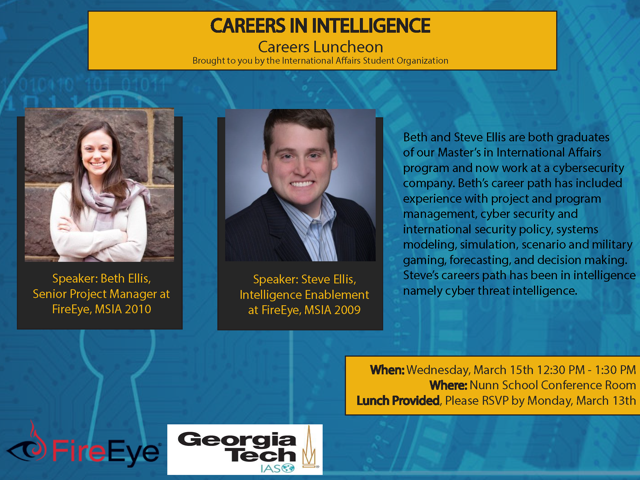 Come meet with Beth Ellis, Senior Project Manager FireEye (MSIA 2010) and Steve Ellis, Intelligence Enablement at FireEye (MSIA 2009) to learn more about career paths in the Intelligence Community! Wednesday, March 15, 2017 12:30 – 1:30 pm Habersham/Ivan Allen College Building, Nunn Conference Room RSVP at: https://goo.gl/V1cVXc by Monday, March 13.